Google Adsense Is the best online option for Earning but for that you have to be an Approved Account of Google Adsense so that you can earn your Online Earning by Adding Adsense Ads to your Blog. 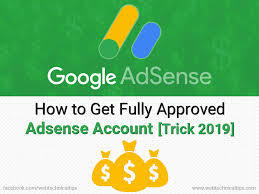 Now if you do not have Google Adsense Approved Account, you can approve Google Adsense Account in 7 days and earn your earnings by placing Google Adsense Ads on your blog. If you want to quickly get, approve Google Adsense Account. You must have to meet Google's Criteria (Terms & Condition), from which Google Adsense approves your account. Along with this, if you want to quickly approve your Google Adsense Account, you have to do some extra things on Focus and your Google Adsense Account is approve only in 7 Days. To quickly approve Google Adsense Account, your blog should be on Blogger because Blogger is Google's product and Google Adsense is also why when you create your blog on Blogger.com, Google Adsense approves your blog quickly. Apply with your Gmail account or brand new Gmail account. Some webmaster also recommends professional email, because it makes it look professional and increase the chance of being accepted. Adding Custom Domain to a Blog Easily Ranks on Your Blog Search Engine When you buy a custom domain, first try to get an old domain because the authority of the old domain is more. From which he quickly ranks on Search Engine, which is very important to Approve a Google Adsense Account. So you buy a Short and Old Custom Domain and after creating the blog, add it to Google Web-master Tools so that your domain starts ranking on Google's search engine and Google can get your domain information. Additionally, by adding Responsive Templates, you can navigate your blog much better because in the Navigate and responsive template, you get access to setup your Header, Top Menu, Sidebar and Footer Sections. When you install the responsive template on your blog, then make sure there are no images on your template or even at the very least, because Google Adsense does not like images. I mean copyrighted images. You can use a Simple or AMP responsive template on your Blog. Pop-ups, pop-unders or exit windows that interfere with site navigation, obscure Google ads, change user preferences, or are for downloads. Other types of pop-ups, pop-unders, or exit windows may be allowed, provided that they do not exceed a combined total of five per user session. 5. Do not use maximum image in blogs. When you published or write an article on your blog, make sure you use Maximum 1-2 Images inside that Post as Google Adsense does not like a website with full of Images and Videos so avoid using Video in your article just for the meantime, and only use relevant images to your article. Try to add Image to all your published article, then keep the image on normal size so that your Image is displayed in your article in a simple way and try to avoid any copyrighted images. Please noted whenever you are submitting for a Google AdSense account application, make sure your website have good quality content. Visitors to your website come to your site because they could find good reading materials. That is what all visitors are looking for in a website. Google AdSense evaluation staff too are looking for this aspect. They are looking at your website content when they are evaluating your site. Get it! It is very important to have Original, Unique and Informative Content on your blog to approve Google Adsense Account. Because Google AdSense quickly approves those blogs. At the same time, your blog should have at least 25-40 posts because when you publish 25-40 posts on your blog, you can also navigate your blog as well for any grammatical error and to check for the readability. And all the posts you published should be at least minimum of 1,000 words. Why did you need a minimum of 1,000 words on your blog? Google AdSense approve blogs that's being unique, not only unique must be free from scraped content. Imaging writing a blog post of 600 words for Approve Google AdSense Account, Man it's nothing for Google AdSense because it can only be unique but not Free from copy scraped content. Means you have to write above 1,000 words to by pass that error. When you write content for your blog, now you can use Headings and Sub Headings so that your article becomes clear and you can clear your topic well too. For example: You write an article and finish your article only within one or two headings, then Google assumes that you have not explained your topic well and that your blog is called Incomplete Content Disapprove it. So you should use more headings and write an article of at least 1,000 words so that your Google Adsense Account should be in less time approved. It's very important to have some pages on your blog to approve a Google Adsense Account. When you create all those pages, you can also share your information with your blog on Google. Which holds very much importance to Google. Google Adsense wants to know more about you and also wants that your Blog Visitors to have information about you. So that, they can contact you if it's important, so it is very necessary to have all Pages that Google Adsense Account required. 8. Let your blog be well Navigate. When yours is well navigating, anyone can easily access all your articles. Navigation is very much important in terms of approve Google Adsense Account. Most blogs are disapproved by Google Adsense team due to bad navigation template. To make your blog navigate well, you can create Main Menu widget ( i.e. Header Menu) in which you can categories all your topics. With this, you also add Category Box in the sidebar gadget and add some extra widgets such as Popular Post, Resent Post, Blog Archives, Label and soon. You do not want a visitor to get lost within your site. This also will make visitors easy to find the information that your site got to offer. The blog with low traffic are highly to get rejected by Google AdSense team. Traffic is much important for early approval from any Successful Blog or Google Adsense. Because Google Adsense we show ads on blogs that benefit both publisher and advertisers, find a means to improve traffic to your blog through Search Engine, Social Media, Email Marketing, Forums, Blog commenting and soon. When you provide good quality of traffic to your blog, Google assumes that people like your blog and they also revisit your blog over and over again for their benefit. How many page views or traffic did you need to get Approve AdSense Account? Google AdSense don't have specific blog traffic, but many webmaster recommended at least 40-50 page view per day, In visitors it means 10-20 visitors per day. In research to Google Adsense Policy, Your Blog should be at least six Months Old but if your Blog is a Month Old and you are Active on that Blog then Google Approve Your Blog. I got mine approved within 20 days old. 11. Choose great niches for Google Adsense Account. Google Adsense always approve the blogs that are made on good niches or topics, so first of all, you have to do some research, that's niches or topics that will increase your Approve Google AdSense account. You should not take any unnecessary and unused topics, as well as doing not take top topics that have 0% unique. For Example: Tech Blogs Because there are so many Tech Blogs available on the Internet today, Google Adsense knows that you can not create anything quality and special for your audience, so your blog will not have more visitors and your blog will be rejected by Google AdSense team. Or takes too much time to approve. So it will be better for you to find niches that are less competitive also try and publish unique content on your blog. When you create a blog for approving Google AdSense, you also have to be careful that you create content on your blog in a simple way because many people uses wrong heading, irrelevant bullet and much more on their blog. If you are doing such things, your blog is not Eligible for Google Adsense and Google team will disapproves your blog. So you should use Bold and Headings only to highlight your content and do not use the colors at all. Which means your blog should be show in a simple and natural way for your audience to understand. To get "Approves Google Adsense Account". You should take note of the above-mentioned points and follow them so that your blog can get approve in less time and start earning. Google Adsense team sees all these things and when implement all point mentioned above on your blog, then your blog should be ready for Google Adsense Approval. For any further question, please use our comment section.